Shana Nissenbaum is an educator, a builder, a community organizer, and a non-profit founder…and that’s just the start of a long list of the many ways she spends her time to make Richmond a better place. 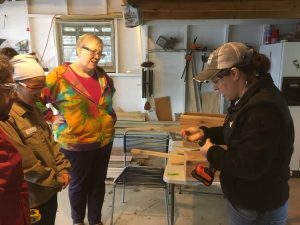 In this conversation we cover a lot of ground including Shana’s work empowering women through power tools via Women’s Workshop Richmond, how she measures success in her classroom, what it’s like to run a maker space, and the different ways she’s learned to build a life and community for herself here. Enjoy! Chris Hardie: You and I know each other from a variety of things around town, we were neighbors at some point. I think I put a small dent in your vehicle when I got overconfident about backing up a trailer. Chris: Yeah, that was me. I probably owe you some money for a fix up paint job there. But moving on from that, we also recently connected over your work in the Women’s Workshop in Richmond. Let’s just start there. Tell me a little bit about the Women’s Workshop and how it got started, what it’s for and what kinds of things you’re taking on right now. Chris: What gave you, I guess, who started it and what gave you the idea to start it in the first place? Shana: Three years ago we moved into my house and I wanted a porch. I got some estimates on a screened porch and it was anywhere between seven thousand and thirty thousand dollars. I just didn’t feel like that was reasonable for literally screens. So a buddy of mine helped me build a foundation, build the frame of it, and then I turned it into a porch by the end of two summers. And I realized like, “Hey, I can do this.” So I had a couple other woodworking projects from there. Then I was at a friend’s house in Minnesota last summer and she was talking about how once a month she gets together with these other women and they go to this one woman’s house and that woman teaches them how to do a craft. She had mentioned that recently they had done a pinata. And I thought, “Hey, I could teach women how to make something.” I had these plans for these giant dice, you play Yard Yahtzee with. You put them in a bucket and you cut up a four by four to make them. I thought, “I guess I could do that.” That was last fall and it very quickly snowballed from there. It was clearly something that was missing from Richmond and for women in general that are missing that skill. This filled that void really easily. And women were interested in it as a hobby, but also for the empowerment piece. Shana: I’ve actually had quite a few men say, “Well, what about me? No one taught me.” And there is a social stigma associated with the men not knowing how. So they don’t really have any opportunity to learn. So at some point, I would like to expand and have a couple of novice men’s classes, but, for now, it’s women and girls. Chris: There’s all sort of interesting cultural things going on there. Yeah, you don’t often see classes for men on how to use power tools. I assume that is tied to some very broad stereotype about men know how to use power tools, “They’re born with a drill in their hand.” Then the corresponding very problematic assumption and stereotype narrative that women don’t know how to use power tools and, in some cases, I’m sure you can find parts of our culture that would say, “Oh, women don’t need to use power tools because the men will do it.” I heard you use the word empower and, yeah, I wonder what you’ve experienced in the women that you’ve worked with and talked to, just beyond the basic knowledge of like, “Hey, here’s how to be comfortable with a power tool.” What kinds of empowerment are you seeing happening? Shana: Honestly, it’s even more than I had imagined and I’m blown away by that part. For example, I had someone come to one workshop and was like, “Ah, I’ve never really thought about owning a drill.” And she came to a second workshop and was like, “Nope, I need one. I need to have one at home just in case.” Her husband is, we’ll say, not particularly handy so we secretly told him around Christmastime that that would be the perfect gift. While I picked it out, he physically went to the store and bought it for her for Christmas. That’s something that she now feels comfortable with in her home. Or I had another woman that came to a couple of workshops and then called me up one day and said, “Hey, I found this thing on Pinterest. 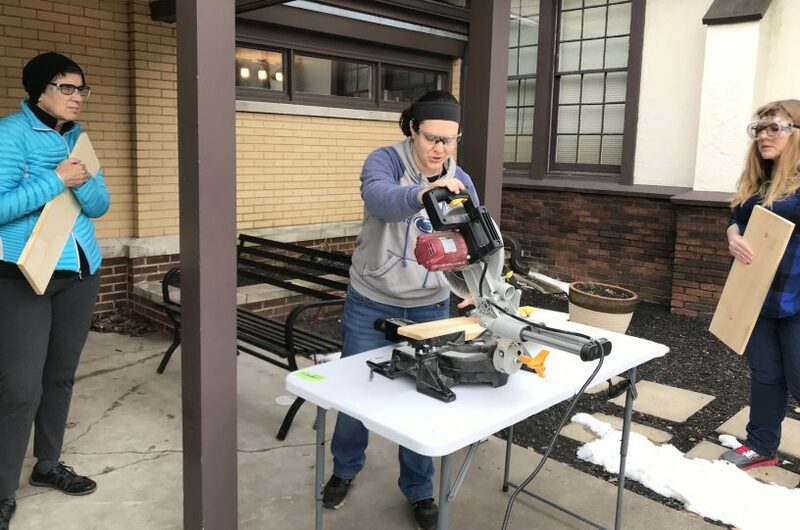 I think I can build it myself if I can use your miter saw.” I said, “Sure. Come on over.” Then she ended up going on a semester long workshop where she learned how to refinish furniture and build her own stuff. Shana: Yeah, it was really cool. They’re not all quite that big, but … and just like the little pieces, of a woman staring at her finished project. We always take pictures at the end and line all the women up with whatever they made and them all standing there and just the pride in their faces of like, “Hey, I made this thing.” It’s awesome. Chris: It seems like it has implications too for something that sounds simple like home repair. You mentioned building a porch, but being able to fix something, repair something, bolt something together, drill something together. That could represent huge economic savings for someone over the course of their life, just being comfortable with that. Has that come up at all in the workshops and training that you’ve done? Shana: Not that specifically, but absolutely the idea of that is part of the point. One of the reasons that we’re transitioning from an LLC to a nonprofit is that, right now, my clientele typically have a little more expendable income. That’s great, I want all women to be empowered, but I’m not able to hit the demographic that I think most needs the power and that would be typically the single Moms that don’t necessarily have a support network or don’t have somebody that could do it for them and allowing them to do it. So part of the reason for going nonprofit is to get more funding so that those women can come either at a reduced price or for free, just making sure everyone has access to it. And another group of the population, or another population, that I’ve been trying to focus on is, I’ve met with Centerstone and I recently set up something with Meridian where they have a residential facility for people that are going through rehab, specifically their women are going to come in … I’m going to bring things to them and they’re going to build things for the facility, like some picnic benches, some yard games, just a couple different things. I think those are probably a subset of women that really have lost all of their personal power. And this is something very hands-on, but also going to give them that empowerment piece back and hopefully that control back into their lives. Not entirely, there’s lots of other things involved, but just another part of it really. Chris: It seems like every step, every piece helps. Where are you holding these workshops now? Do you have one facility or does it move around? Shana: That’s a great question. Right now, they’re in my “workshop” and we’re going to put that in quotes, it’s a two car garage. But I am in the process of working with a couple of different people. There’s a couple that owns a storefront downtown that is interested in helping out if we can get that going. I’ve also spoken with RCT, the Richmond Civic Theater, about maybe sharing their workspace and in return, the women could help build the sets. That would be a nice symbiotic relationship. I’m not really sure. I’m open to anything. I’m looking for, with a nonprofit looking for something very low cost, but I’m definitely expanding faster than my space will allow. Chris: That’s amazing. It’s also worth mentioning that we connected through the KIND.ARMY project that I started in. There’s a project that you and your group are taking on as a part of that. Can you tell us a little bit about what that’s about? Shana: Yeah, absolutely. I’ve done a ton of partnerships so we can come back to that piece, but one of the ones that I did through the Institute for Creative Leadership is, I paired up with Deirdré Schirmer who works at Morrisson-Reeves. I said, “What’s your take on Little Free Libraries?” I didn’t know if Morrison-Reeves saw that as competition or whatever. She said, “The more books, the better.” So she and I got together with Alissa McDivitt-Cox and we are building six public Little Free Libraries in different places and towns. One of them is going to the ER, one was going to Leland and just other places where those people are going to have some good foot traffic, a couple of different parks and whatnot. Chris: Wow. And let’s make sure the people know what a Little Free Library is. Could you just explain the concept? Shana: Yeah. It looks like an oversized birdhouse and whoever is the steward of it, whoever keeps track of it, just makes sure books go in it and that any passerby is welcome to give a book or take a book or just sit down. We have one out front of our house and we put it right by the retaining wall so that people can sit there and read a book, hopefully. We’ve had to restock it a couple of times already. KIND.ARMY was incredibly generous because, unless those are registered on the international map, you don’t actually know where they are in town. I think there are four in town and only three of them are registered so there’s no way to know where the fourth one is. KIND.ARMY is paying for the registration of those six public ones so that people will know where else in town to go to. 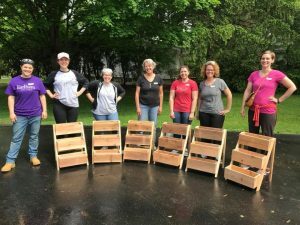 Then Deirdré and I are also running two workshops out of the library this summer with six women apiece, where women can come and build their personal Little Free Libraries and then take those home and be their own stewards of them. Chris: I can’t help but notice, beyond the book aspect where it’s access to books which is great, there’s something really interesting about the idea that you’d have an oversized birdhouse or a library in your front yard or in a public space where, typically, we don’t think of those as places where you pick up free things or leave free things, and so, it’s similar to empowering women with power tools. It’s sort of crossing a cultural boundary that doesn’t necessarily need to be there but that may be for some folks. And it encourages a little bit of a new kind of connection, a new kind of exploration in the world around us. In some ways, very simple, and in some ways, kind of radical. Would you say the same? Shana: Yeah, that was actually a big part of it, so the focus from the Institute for Creative Leadership was how can we have a better neighborhood, a better community? How can we build that? And we thought little free libraries are the perfect way. We’ve met a couple of different people that have come by either wanting to build their own or just want to get books or are dropping off books or just to say, “This is really cool.” And it’s already promoted a little more community just right there for us. So that was part of the intention there. Chris: You mentioned going through the Institute for Creative Leadership recently. What was that experience like? Again, for folks who don’t know what it is, maybe you could say a little bit about what it was and then talk about your experience of it. Shana: Yeah, it was amazing. It’s sponsored by the Women’s Fund, and it’s just these four workshops that you go through in the month of April, and it teaches you about how to be a leader and what kind of leader you are and what kind of people you should surround yourself with if you are that type of leader. Shana: And another big piece was the networking, so pretty much anybody there is wanting to do something enrichment, and so, I got to meet … Well, I met Deirdré, and she works with the library. And Alissa is there, and she works for the hospital, and I met a bunch of people that work for the city, and I met some hair stylists and just all these different people in all these different realms of Richmond. And then, I think for me, the best part was I think a lot of people talk about like why? When we first moved here, people said, “Well, why would you move here?” And we just feel like Richmond is what you make of it and that ICL has been a perfect component of that. Shana: There were all these other people there that just want to make Richmond better and want to do these good things, and how do they enact change? And I got to fill myself with that kind of spirit, that kind of enthusiasm towards change. Chris: I think you professionally are an educator, and I wonder if you could tell us a little bit about your career and your path there and what that has shown you or taught you about kids, schools, the state of education in our region. Shana: So, yeah, I teach third grade language arts. I teach at National Trail, which is just over the border, and I absolutely adore it, so let’s be clear that, right now, this is a side gig. And so, they actually have it tied in really well. I have a tattoo on my wrist that says “learn” because all the time, I’m learning something new. Shana: And sometimes, that’s just in the classroom that my kids are teaching me, and sometimes, that’s about my own teaching. And the Women’s Workshop has been huge for me. I enrolled in carpentry school at Ivy Tech, and I’m getting my carpentry certificate there. And it’s crazy to think back to when you didn’t know something. So I’ve been in teaching for so long that I kind of understand, at least have schema, for anything new that comes up. And I forget that the kids don’t. Or he’ll say, “You read that in the book. Don’t you remember?” I’m like, “Nope, I don’t remember the eight different types of fasteners that I read about in my textbook.” So it’s just helped remind me that the kids need that constant reinforcement. They need that constant hands-on thing, and they need to be submersed in it before they can really grasp it and understand it. So it’s just really helped me to be a better educator. Chris: Are you able to track when you’re working with a student in your class and then to see their progression through school over the years? Are you able to trace some of the things that they learned while working with you through their time as a student as they get older? Or is that hard to do? Shana: It won’t be hard to actually see, but the way that the standards work, they’re cyclical, so they build on top of teach other. But I also know that the skills that I’m teaching them are … So third grade is the big transition from learning to read to reading to learn. And so, that’s where they make the change into finding the main idea or talking about the character traits of a specific character and finding the text evidence, and you’re going to do that for the rest of your life, saying how that character felt and then proving it with pieces from the text. And it’s also our standards are so crazy, and the testing is so crazy now that I teach my kids in third grade how to write a five-paragraph essay, citing their sources from two … or citing their, yeah, citing their sources from two different sources. Shana: From two different texts, which is just … It’s crazy. And they have to do that in an hour and a half for their test. So a five-paragraph essay is something they’re going use, obviously, throughout the school, but even when you apply for a job. “I’m the best candidate for this job, and here are my three reason.” And then, that turns into a five-paragraph essay. So I know that those foundational skills that I’m teaching them will be forever. Chris: People talk about the way that testing has transformed education and that teaching to the test is, in some ways, important and in other ways, can be really constraining or really a challenge for educators. What has been your experience with that, and I guess, as you think about how education has changed in the time that you’ve been in it, are we headed in a good direction? Are we headed in a bad direction? What’s the way to talk about that? Are you actually teaching the standards that you’re supposed to be teaching? And do the children actually understand what you’re teaching? Honestly, I feel like a standardized test does that. In terms of teaching to the test, I teach them the skills that they need. And I teach them the content. I don’t necessarily teach to the test. Or you go to become a hairdresser, and you have to take that test. If you’re going to be a teacher, you take that test. We have standardized testing for the rest of our lives, honestly, so I think it’s really important that they understand those skills. And I also am a little more focused on data tracking, I think, than lot of teachers. So I think a lot about that and what those numbers mean and how my kids are progressing. Chris: Do you find yourself bringing techniques from your classroom into the Women’s Workshop in terms of the structure and the formality, or is it a completely different kind of workshop or teaching experience? Shana: No, I find it to be the same in literally everything that I do, so I also coach softball, and one of my favorite age groups is the little girls because it’s all about … For somebody that’s new, it’s two things, and I find this might be even more for women, but it’s two things. It’s actually teaching the foundational skills and building the confidence to allow them to continue progressing through those foundational skills. And I do both of those things really well. I do a really good job with the breakdown, and I do a really good job with feedback. So saying, “You didn’t do it the correct way. Here’s the way that you should be doing it” and then, reinforcing when they do it the correct way. And I think that’s really important pretty much everywhere, but definitely in all the things that I’m doing between teaching third grade or coaching middle school or showing 60-year-old women how to use power tools. It covers everybody really. Chris: Tell us about some of the other things you’ve been involved in over the years. Every time I think I understand the organizations, the projects, the activities that you’ve been involved in, there seems to be more. So what are some other things that you’ve done in your time here in Richmond? Shana: One of the other things that I used to do was skate for the Dire Skates, for the roller derby team. I blew out my knee, so I now am a co-announcer with Dave Snow. He and I announce all those bouts. And that’s a really awesome thing to be a part of in Richmond, and that team is just so cohesive, and again, like a big part of that empowerment piece. That team is constantly picking each other up. So I love being a part of that. I run a makerspace at school. The art teacher and I on every Thursday have kids of different grade levels, and they come in, and I want you to imagine you’re eight years old, and you were going to build a robot. What are the things that you would want to build this cardboard robot? And we provide them with all of those things. We give them X-ACTO knives and glue guns and awls, anything that they would need to attach all of those things and build this thing or that thing. And then, in alternating weeks, we actually teach them a skill, and they have to build something with that. For example, we show them how to make an axle out of a straw and a skewer, and so, they can actually … They learn how to make their wheels on something actually move so that the next time they come back, and they come for a free day, then they can build. The next time they build a car, they can actually make the wheels move. Chris: Is that an optional, makerspace? Is participating in that optional, or is it a part of the curriculum? Shana: No, it’s an after school club that we started for second through fourth grade. Chris: How many robots have you seen come to fruition in that time? Shana: Well, the robot is more just to conceptualize like what kind of stuff that we give them. But I have seen quite a few robots. One of the actual missions that we give them is to make a robot with moving parts. So we teach them how to affix cardboard without it just being stuck together. We were talking about how to get the coke bottle tops to fit on a skewer and it’s a real, I don’t know if you ever pay attention to it but it has like a plastic lining to it so it’s really difficult to attach on this hot glued stick, this little girl came up with the idea of taking a piece of cardboard, like a puffy cardboard, what was that called? Shana: Yeah some corrugated cardboard, the put it in there and that stuff skewer back in so it had something to hold it in there, for me it was one of those moments where when she shared with the group how to do this, I genuinely tried not to cry about it. That transformation was amazing, her mom sent me a text like, “You can’t imagine the self esteem that you’ve built” and it just, yeah. Chris: It seems like maybe this is something you’ve known a long time but my awareness in recent years thinking about the benefits of creating spaces where there are materials, there’s tools, there are potential activities and then letting a child, a student, even an adult as you said just sort of encounter those things and discover on their own, what’s the thing that they’re gonna create or they’re gonna do with it, that as a vehicle for learning and for education, can be a pretty powerful compliment to what you might call more traditional learning environments. I can’t help notice that theme in some of the things you describe, it sounds like you have a real passion for that kind of learning. Shana: Absolutely, it’s huge. There’s an amazing scene in Apollo 13 where they, I don’t know if you remember this, something goes wrong up in space and so they tell them, what’re the pieces that you have? Let’s figure out how we can fix it with those pieces. Chris: Yeah you get the big box out and dump it out on the table, start to figure it out. Shana: So I have some parents that sometimes try to come help with the maker space, it’s called Fab Lab and I tell them the only rule is you can not help. They kind of stare at me, and I’m like nope, you can talk them through it or you can give them some guiding questions but you absolutely cannot do it and you can’t tell them how to fix it. I’ve actually had a couple parents that say, “I can’t help with this, I can’t handle that part” Whereas for me at this point it’s almost second nature, I’m gonna let you struggle through that other than maybe telling you to be a little more careful with that X-ACTO knife, otherwise that’s so much of the learning process. When they work for NASA one day they’ll be able to fix the space station from down on Earth because they had the outside the box thinking that they needed. Chris: That’s so cool, there’s something really encouraging about we start to think of engineering as a bit of a lost art when we think about all the automation that happens and everything in software, I don’t know, it’s really neat to think about kids, young people, everyone. Getting their hands on something, building something, figuring it out and developing that instinct for the mechanical and creative problem solving around that so. Shana: Yeah it happens even in carpentry, I have this job this summer where I’m helping to build houses and like occasionally a piece just doesn’t … Not occasionally, often a piece just doesn’t fit or it doesn’t work and everyone’s kind of standing there like okay so what can we do to fix this piece? You have to think about other ways to fix it or one just doesn’t go the way its supposed to go sometimes. Chris: I want to come back to something you said about Richmond being a place where I think you said Richmond is what you make of it, I just want to ask a little more about what your experience has been like building a life in Richmond, Richmond as with any community it’s a place with its challenges, with its opportunities, with frustrations. What has that looked like to you over time and what do you see as some of the opportunities or the challenges that are ahead right now? Shana: I feel like that’s a great question. A lot of people talk about Richmond as a small town with some big city problems, or I’ve had some friends who talk about how there’s nothing to do here. A good example of combating that. My wife Maggie is vegan and I’m somewhere between vegetarian and vegan, there wasn’t any sort of community like that so three years ago I think we started a once a month vegan potluck. It’s super cool and so we just get together once a month and it’s amazing to be in a community with those people where I say, I don’t even have to ask you what’s in this, it’s not gonna make me sick and that’s awesome. Then, it’s grown, it started out there were six or seven of us that were consistently going and we recently had a picnic themed one, there were 17 of us at that one. It’s cool to see how that’s grown, that’s just one example of, “Hey that thing didn’t exist so we just started it” Which is kind of the same thing that happened with women’s workshop or with the maker space, all those pieces for me, I’m gonna just do it. Chris: I like that Richmond is a size where you can just do it. I talk to people who live in other cities. Sometimes it’s the logistical challenges of bringing a certain community together, sometimes it may be just a city that already has everything one could ever want and so maybe the best thing to do is just to show up and participate in things that other people have created but Richmond is a place where it’s small enough, you can get the word out fast enough, you can know people well but you can also meet new people every day and so if you want to create a project, if you want to have a new experience, it seems like Richmond is a really great place to do that, a really great testbed for experimenting organizational building and all that sort of thing and it sounds like you’re really taking advantage of that. Shana: Yeah I am, I find that it’s exactly perfect, exactly what you said there. It’s small enough that that thing might not exist and it’s big enough that I can find other people that wanna do it, you just gotta get the word out there and with this new organisation I have been meeting people constantly and I still find, somebody will say, “Do you know so and so” and I’m like no, and I don’t know why I don’t know that person yet. I’m just constantly building that kind of community piece for myself. Chris: You’ve obviously taken on a lot of projects and you’re in the middle of a lot of things, what’s on your wishlist for the moment you have some free time, what’s the next thing you’re gonna start or create? Shana: Oh, I mean I have some little things that need to be done around the house, the porch still doesn’t have a gutter which I need to do, the lawn needs to be mowed, if I had some free time I would do that. Otherwise, I really enjoy the building piece so I do spend a lot of my time building other things, I have a couple other hands on things I’m building a domino table, because I built some domino tables at the AMIGOS Gala and so I got a couple of people that wanted domino tables, a giant Jenga for the Shakespeare Festival, I don’t have any free time to really answer that question, Chris. Chris: We’ll have to get someone to come over and mow your yard for you so that you can do some of these other fun things. Shana: I did that two summers ago, I didn’t know how to mow lawn so I joined up with a lawn mowing crew and ran a mower for the first time in my life, for an entire summer. Shana: My next door neighbor wants me to start a podcast, sort of like that 60 days, or 30 days was like a show. Chris: Yeah Morgan Spurlock’s thing. Shana: Yeah, he wants me to have a podcast where I talk about the different jobs like lawn mowing, now building houses. Chris: Well maybe let this be the first episode or the introduction to that and then you can run with it. Shana: Maybe, I’ll do that in my free time. Chris: If someone wants to learn more about Women’s Workshop Richmond, where should they go? Shana: They have a couple options, we have a website, WomensWorkshopRichmond.Blogspot.Com but their best bet definitely is to go to our Facebook page, it’s Women’s Workshop Richmond, there are links on how to sign up to upcoming workshops and to see some pictures of what it’s like and just generally get more information, my contact information is in there but you can email us at womensworkshoprichmond at gmail.com. Chris: Awesome, Shana, Thanks so much. Best of look with all your projects and I am so looking forwards to seeing the results of all these fun things popping up around town. Shana: Chris thank you so much for having me, I can say the same for you, it just seems like you have your hand in quite a few things as well so anybody who does know about kind.army has been super awesome and it’s only a month in. Chris: It’s a fun experiment so, thanks. I believe this is a wonderful project and wish I could sing up to gain the confidence I’m looking for to fix everything around my house…including the backyard.